Sun Peaks horse rides are a fun, family friendly way to explore Sun Peaks Resort and the surrounding areas. 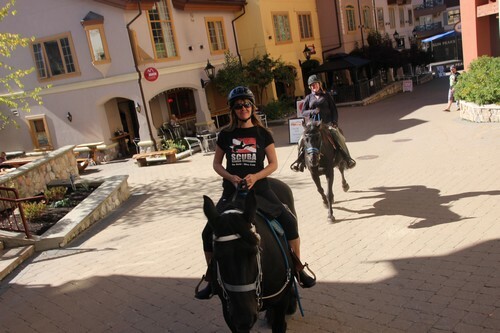 And if you’re lucky like we were, Rebecca and/or Robert from Sun Peaks Stables will take you for a ride right through the village or right past your Sun Peaks accommodation! 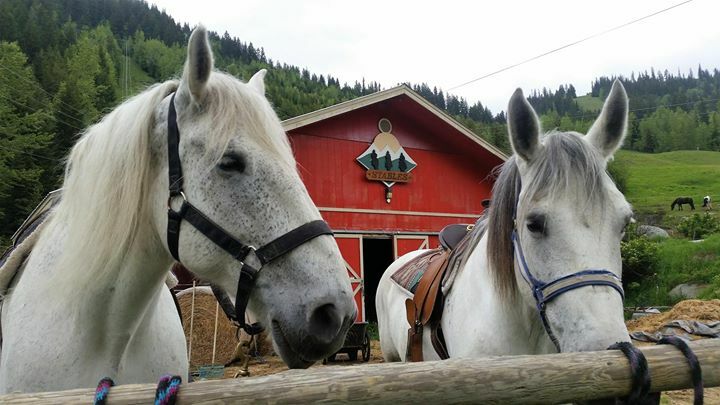 They have only been operating at Sun Peaks since 2013 but bring many years of excellent customer service and their love and passion for horses along on every trip. 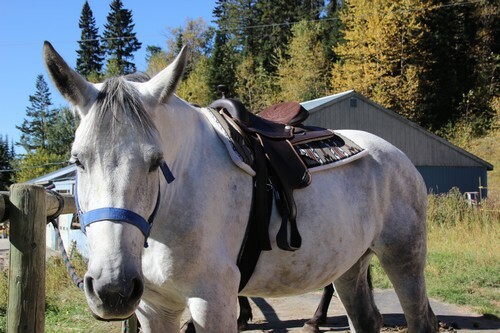 With their stable of friendly and well-mannered Percheron draft horses, they provide a number of Sun Peaks horse rides and other options to suit everyone. New in 2017 is the Sun Peaks Horseback Riding Lesson Program. Riding lessons are one hour each and include the basics of grooming, horse care and English style riding, and will commence in early May as weather permits. Lessons will take place in the new riding ring near the Burfield Stables, and riders must be five years of age or older. Plan your spring or summer getaway in advance and book by April 21st for a 25% Discount on the riding lesson packages. Group riding lessons, with a maximum of four riders, are available in single, 5 and 10 lesson packages, while private horse riding lessons are available in a 5 lesson package. They will have set times throughout the spring, summer and fall for group lessons, while private lessons will offer more flexibility in scheduling. “Earlybird” Special 25% Discount, if booked before April 21st, 2017. Prices subject to change - contact Sun Peaks Stables for details. Pony rides for the little ones are typically available near Sun Peaks village during special events and at the Sun Peaks Stables (near the Burfield chairlift) by special request, subject to conditions and availability. Riders must wear a helmet and are lead around by parent or guardian walkers. The kids love it and so do the ponies!! Costs start at around $9 for 5 minutes and go up from there. 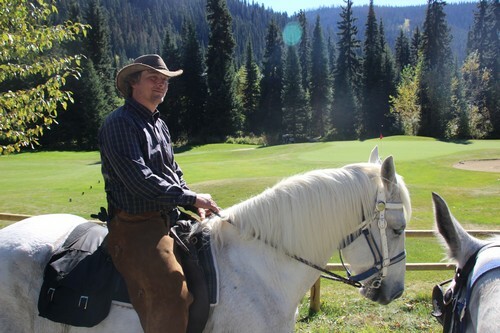 Trail rides are a great ‘green’ way to tour Sun Peaks Resort and the surrounding areas. Small groups, families and others can enjoy a guided, scenic tour with up to 5 guests and let these gentle giants show you a different perspective of the tranquil resort area. Trail rides vary from 30 minutes to 6 hours and are subject to weather and safety conditions and availability. You can also ride off into the sunset with a one hour sunset trail ride. 2 hour Valley View Trail rides with beautiful scenery and perhaps wildlife sightings are around $100, a 4 hour Mt. Morrisey Summit trail experience for $200, and a 6 hour scenic ride to the McGillivray Lake Outpost for $300/person are some of the options, as well as custom, private trail rides. Riders need to be 10 or older, but kids from 6-9 may be able to join on a guide-lead horse. Custom trips and routes may be arranged as well, with prices starting as low as $45/person. Helmets are mandatory, and shoes with a heel are required (a limited selection is available) and long pants may be desirable. Available spring, summer and fall, weather and trail conditions permitting. Dashing through the snow…..No matter the season, custom Sun Peaks carriage rides are available for either just the two of you for a little romance, or for you and up to 8 friends or family members, or maybe a few of each. Wheels are used in the summer, and snow runners are added as soon as there is enough fresh Okanagan POW on the ground. This is a great add-on for any of your special events while up at Sun Peaks, for only around $175 group. During peak season, regularly scheduled horse drawn sleigh rides are available as well for individuals and others. Do you need more horsepower? How about a Sun Peaks Snowmobile tour then? New in 2014/2015 is the option of a 24 passenger trolley ride through Sun Peaks Resort. 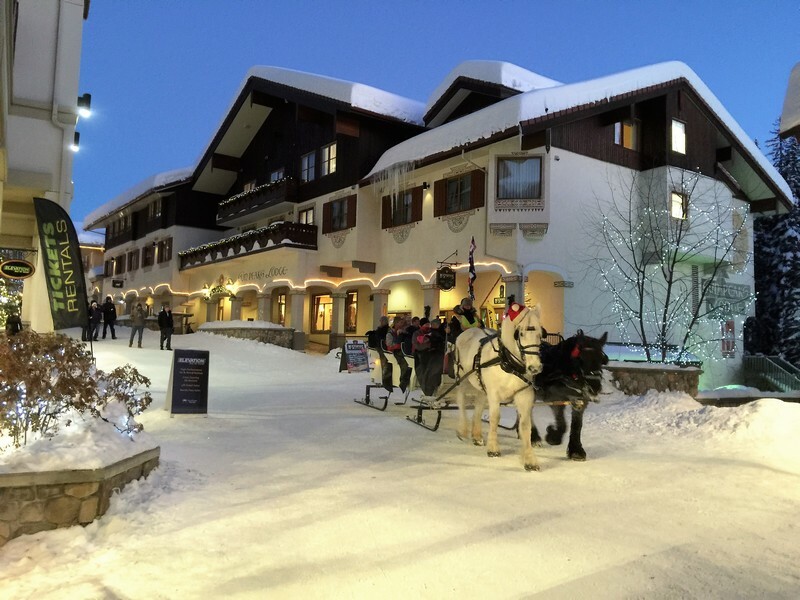 Just like the Sun Peaks Stables sleigh rides, their beautiful Percheron draft horses will take your large group for a beautiful trolley ride around the resort and perhaps even through the village. All of these various Sun Peaks horse rides are typically available daily by special request, but be sure to book ahead to avoid disappointment. Rebecca and Robert are great hosts and you will have a great time, just as we did! Yet another fantastic family friendly activity at Sun Peaks Resort. And book a stay at our beautiful Best Sun Peaks condo in Stone's Throw or luxurious Best Sun Peaks Trapper's Landing Townhouse.